When I first picked up this book I didn’t think it would hold that many interesting ideas about the psychology of eating. I was wrong. The author has setup many interesting studies regarding what causes us to increase our caloric intake at the psychological level. If the mind can trick us into consuming an extra 100-200 calories a day that will result in a weight gain of 10 pounds a year. If we are aware of the mind tricks then we can reduce 100-200 calories from baseline, resulting in a 10 pound weight loss. One study covered the effects of larger packages (Costco size). We all consume more from big packages, whatever the product. Give people a large bag of dog food, they pour more. Give them a large bottle of liquid plant food they pour more. Give them a large shampoo bottle or container of laundry detergent, they pour more. Pace yourself to the slowest eater. Avoid additional helpings by leaving some food on plate. Decide how much you will eat prior to the start of the meal. There is also an outstanding section the effects parents have on their children’s eating habits. A baby can sense food aversion from a parent and develop the same aversion. That chapter is full of tips parents can use to expose their kids to a diverse healthy diet. 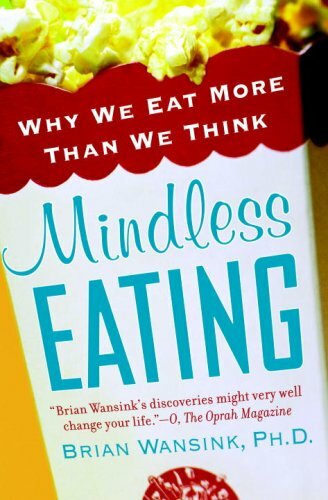 I highly recommend Mindless Eating. They did a peice on this guys work about a year ago on 20/20, I think, and some of his demonstrations were pretty amazing. Two some immediately to mind. In the first, people took more food when they were given a bigger plate to serve themselves with. In the second, they took more food from a cafeteria when the food had a more appealing name. People took far more “Creamy Mac and Cheese” than they did when the same food was simply labeled “Mac and Cheese”, for example.